The Harris TP9300 series is an Analog/ DMR Digital /Analog Trunked/ DMR Digital Tier III Trunked Two way radio that’s 5.35” tall, weighs 11.46oz. It is available in three versions. The TP9310 No Display 16ch,The TP9355 Display with limited keypad model with 1000 channels and the TP9360 Display with full keypad model. Both radios can be software upgraded to 2000 channels. The TP9361Aex is available as an IS (Intrinsically Safe) LCD Full Keypad Model. This ergonomic, VERY rugged two way radio with internal 2 Watt speaker allows for loud and clear communications. The TP9300’s frequency range allows Federal and commercial frequencies to be programmed. Covering the UHF 400-470Mhz, 450-530Mhz bands with 4 watts, the VHF 136-174Mhz band with 5 watts, the 762-870Mhz band and the 896-941Mhz band with 3 Watts. The TP9300 series can be used in Analog direct and repeater, DMR Digital direct, repeater and trunked mode covering the Tier 2 and Tier 3 formats. The TP9300 series meets the IP67 rating. This rating identifies the radios as being fully protected against dust and water immersion to 3 feet for 30 minutes. The IP67 protection rating makes the TP9300 series the ideal communications device for wet, dusty, rugged environments. Large channel select and on/off/ volume control knobs can used while wearing gloves. The TP9300 includes belt clip,1880Mah Lion battery, antenna and a desk top charger for convenience. A 6-Unit charger is also available allowing multiple units to charge from one AC outlet. 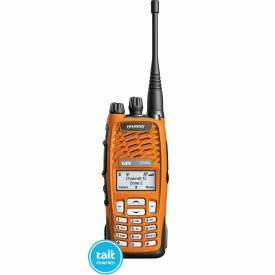 With a optional 2400Mah lion capacity battery and based on the 5-5-90 standard, the radio can provide up to 12 hours of communications. Its compact yet rugged design Meets and exceeds MIL-STD-810 C/D/E/F/G standards and is IP67 rated against Dust and submersion in water. The TP9300’s size, features and ruggedness offers Hospitals, Police departments, Fire Departments, and Federal agencies a fully featured two way radio that is palm sized and can provide years of service in those demanding environments. The TP9300 is covered by a standard 2 year Manufacturer’s warranty which can be increased to 3 years with the optional 1 year extension.